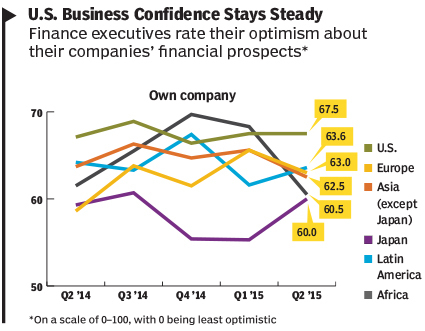 CFO confidence remains steady in the latest Duke/CFO Global Business Outlook Survey, but worries mount over wages and data security. Finance executives in the United States, Asia, and Europe are optimistic about their regional economies, but not so their counterparts in Latin America, according to the Duke University/CFO Magazine Global Business Outlook survey for the second quarter of 2015. The survey also reveals potential risks for U.S. companies from wage pressures and from a surprisingly widespread exposure to corporate hacking. This quarter’s survey results are based on 947 responses from finance and corporate leaders in the United States (489), Latin America (152, including Mexico), Europe (135), Asia (94, exclusive of Japan), Japan (42), and Africa (35). Full results for the current and historical quarters are available at www.cfosurvey.org. On a scale from 0 to 100, U.S. executives rate the outlook for the economy at 62.9, down from 64.7 last quarter but still the third-highest score posted since 2007. U.S. companies plan to increase capital spending by an average of nearly 6% over the next year, and also to increase spending on advertising and marketing by more than 4%. 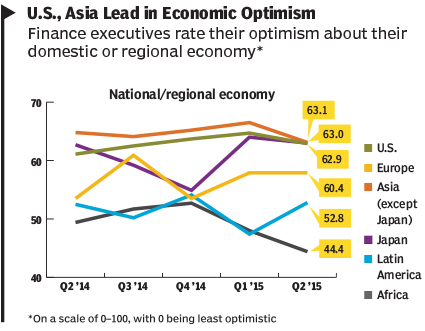 Respondents from Asia (outside of Japan) are similarly positive about their economies, rating them at 63.1 on a 100-point scale. However, in contrast to the trend seen in the United States, responses from Asia represent a sharper decline from the levels being registered two or three years ago. Perhaps in an effort to counteract the effects of slower economic growth, respondents from Asia expect to boost spending on advertising and marketing by 7.6% over the next 12 months. In Japan, the level of economic optimism remains relatively steady, at 63 out of 100, but executives there expect capital spending to rebound strongly. Wages are expected to rise by only 2% in Japan but by more than 6% on average in the rest of Asia. Indeed, wage inflation is the top business concern in China. European optimism rose from 57.9 last quarter to 60.4 this quarter. This represents the second-highest level seen in Europe since 2007. Capital-spending growth will be modest, at less than 2%, but employment is expected to increase more than 2% for the first time since 2011. European respondents also expect wages to rise by about 2%. In contrast to the rest of the world, Latin American economic optimism remains low (52.8) overall, although it varies quite a bit by country. Brazil is the most pessimistic large economy in the world, with optimism of 35.7 on the index and no growth seen for the median firm in either capital spending or hiring. Chile, Peru, and Ecuador registered modest economic outlooks, in the low 50s. Mexican respondents are much more optimistic, registering in the low 60s, and they plan to increase both capital spending and employment by more than 8% this year. Wage increases are expected to average about 4% across Latin America. Top concerns in Latin America include economic uncertainty, currency risk, governmental policies and regulations, and weak demand. Brazilian respondents are also very worried about inflation. In the United States, finance executives expect wage hikes of more than 3% over the next year, with full-time employment increasing by more than 2%. Wage and employment growth is predicted to be strongest in the technology, services and consulting, health care, and construction sectors, but weaker at financial services firms and businesses in the energy sector. Over the past few quarters, wage-growth expectations for U.S. companies have been the highest seen in the survey for many years. This quarter, 7 in 10 respondents expect salaries to rise by at least 2.5% over the next 12 months, and a quarter anticipate increases of more than 4.5%. At that pace, wage growth would outpace respondents’ expectations for the inflation rate, which has remained stuck at around 1% in the two most recent quarterly surveys. Salary projections may be reflecting a prolonged tightening in labor markets, especially for specialized skills. In fact, U.S. respondents indicate that difficulty in hiring and retaining qualified employees is one of their top three concerns this quarter, and this concern is particularly high in industries that rely more on skilled labor, such as technology and health care. Others cite concerns about global deflation or a global economic slowdown. These concerns leave some companies feeling especially exposed to foreign competition. In one of the most surprising results from this quarter’s survey, more than 80% of respondents from U.S. companies who elected to answer a question about data security indicate their systems have been successfully hacked in an attempt to steal, change, or make public important data. (Approximately three-quarters of the U.S. executives provided a response.) The hacks have been more successful at smaller firms: 85% of companies answering the question that have fewer than 1,000 employees indicate their systems have been successfully penetrated, compared with about 60% of larger companies. More than 85% of respondents from firms in Asia, Europe, Africa, and Latin America say they also have been hacked. U.S. companies have taken a number of steps over the past year to address hacking and data security. Primarily, they have installed new software or changed procedures in order to guard against data breaches (64%). Other steps taken include requiring employee training (33%), purchasing new hardware (31%), hiring data security firms (28%) or additional staff (16%), and testing security by attempting to hack into their own systems, using either consultants (19%) or their own staff (13%). The hacking problem may be even greater for small and midsized firms as a result of fewer resources being dedicated to data security. Survey results show small firms are only about half as likely as large firms to attempt a “friendly hack” into their own systems, to hire new data security staff, or to require data security training for employees. With firms searching for whatever edge they can gain against intensifying competition, they may well consider taking a more proactive stance on cybersecurity risks and the potential impacts on customer confidence. Wow – 80% of respondents from U.S. companies who elected to answer a question about data security indicate their systems have been successfully hacked in an attempt to steal, change, or make public important data. That really is a damning stat.